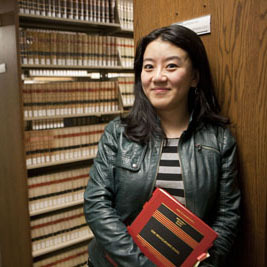 In her third year at MIT, Shee Shee Jin took a class that set her on course for law school. “The class was called Regulation of Chemicals, Radiation and Biotechnology, and on the first day, the professor said, ‘I apologize in advance, because this class may make you want to go to law school,’” she recalled. “It was a really interesting mix of science and statistics and policy and economics.” The class helped Jin realize that she wanted a career that involved high-level problem-solving and touched many different areas. As a 2L, Jin confirmed her interest in regulatory law in Government Contract Law with Darwin Hindman ’93 (BA’88), an adjunct professor and partner with Baker Donelson who specializes in representing clients with government contracts. “A lot of contracting principles we learned in our 1L Contracts class don’t apply, because federal contracts are based in statutes and regulations instead of common law,” she said. “I’ve been recommending the class to everyone.” Jin also applied her understanding of government contracts as an extern in the False Claims group of the Tennessee Attorney General’s office. She chose to join the staff of the Environmental Law & Policy Annual Review, where she is 2015-16 editor-in-chief, because of its regulatory focus. Jin mentored eight LL.M. students, all of whom are foreign attorneys spending a year at Vanderbilt studying U.S. law, during the 2014-15 academic year. “I really enjoyed introducing them to Nashville and helping them get integrated into the life of the law school,” she said. “They’re only here a year, and they add a really interesting perspective. I worked through the Vanderbilt Bar Association to get them more involved.” She also volunteers each month as a respite care provider through Nashville’s Alive Hospice. Jin loved her undergraduate experience at MIT because “it’s a really collaborative place where you’re able to explore things together,” and she has found the same atmosphere at Vanderbilt. “During the first semester you’re all learning how to be law students while you’re learning about the law, and it really helps to be in an environment that will foster that process,” she said. Jin was a summer associate at Hogan Lovells US in Washington, D.C., during summer 2015. She spent summer 2014 in D.C. with Keller and Heckman. 2015 Summer Associate, Hogan Lovells US, Washington, D.C.